Even though many cases of depression respond well to treatment, not everyone is seeking medical help. A recent study found that only half of Americans with depression receive any treatment, and only a fifth get the treatment recommended by the American Psychiatric Association. 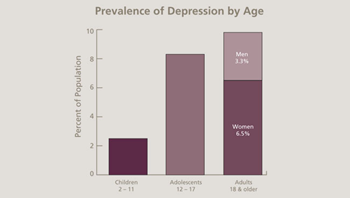 Up to 30 percent of depression cases, meanwhile, don’t respond to conventional therapies. With continued funding from the National Institutes of Health, however, scientists can develop more effective drugs, refine therapies for treatment-resistant depression, and increase awareness of treatment options. Because no objective test for depression exists, doctors must conduct lengthy psychological exams to diagnose the condition. But brain scan techniques in development may more objectively detect depression, determine its severity, and identify the best treatment. Geneticists are trying to pinpoint mutations that make people susceptible to depression, which may provide new targets for drug development. Genetic research also may help predict the best treatment option for a patient and anticipate the severity of side effects. Scientists are developing drugs that work in hours, rather than days. Recent research, for instance, has shown that both ketamine and scopolamine may improve mood in people with treatment-resistant depression within four to six hours. Clinical trials also continue on triple reuptake inhibitors, medications that block the reuptake of serotonin, norepinephrine, and dopamine simultaneously. Scientists also are exploring treatments that target the immune system, after discovering that immune-triggered inflammation causes depression-like symptoms in animals. Other new drugs may target the stress system. In animals, overactive stress responses reduce the natural replacement of brain cells in the hippocampus, an area that shrinks in people with chronic depression. Scientists are refining alternative therapies for serious depression. Electroconvulsive, or electroshock, therapy has shown consistent success, and researchers are investigating more precise delivery methods and long-term side effects. Transcranial magnetic stimulation — the use of magnetic fields to stimulate brain cells noninvasively — and vagus nerve stimulation, or activation of a major nerve leading into the brain, have been approved to treat depression in the United States and other countries. Deep brain stimulation, which uses a surgically implanted electrode to target select inner brain regions, has offered promising results. Depression often doesn’t come alone. Many conditions can cause depression, and people with depression become more prone to other psychiatric disorders, such as anxiety or post-traumatic stress disorder. Scientists are finding that depression may share common underlying biology with many neurological diseases, including Parkinson’s disease, Alzheimer’s disease, chronic pain, and epilepsy, as well as with neuroendocrine diseases such as Cushing syndrome, diabetes, and thyroid disease. In fact, half of antidepressant medications are now prescribed for conditions other than depression. Continued funding for depression research is therefore likely to provide insights and therapies for diseases that affect tens of millions of additional Americans. Copyright © 2016 Psych Pedia. Powered by Blogger. The Science of Happiness: Why complaining is literally killing you. Do People See Emotions In Your Face That Aren't There? Doctors look after our mental health but who looks after theirs? Why Is Popping Bubble Wrap So Satisfying?